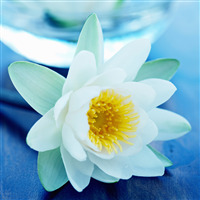 In many Asian cultures, the lotus flower represents elegance, beauty and purity. 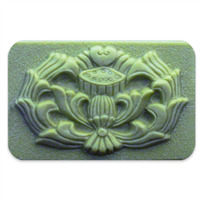 The Guest Lotus Soap Mold adds elegance to any soap line. Bar Length: 1.5" Bar Width: 1.5"
"ONE OF MY FAVORITE MOLDS"
COMMENTS: This is one of my "go to" molds for my products - Love the size and the details! COMMENTS: Used the molds for shower steamers. They come out looking pretty. 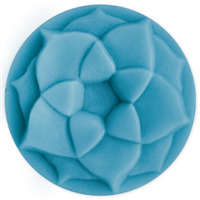 COMMENTS: This is the cutest little mold I have ever seen and perfect for my fizzie shower tabs! COMMENTS: The tarts just fell out of the molds, no pushing or coaxing required. They came out so easily I am so pleased with this mold. This is my first experience with Milky Way molds and I'm off to a great start. The detail in the lotus flower was crisp and clean. I filled the mold to the top and the tart was the perfect size for my burner (and measured out at exactly .65 oz). Great mold at a great value, will definitely recommend to my friends and colleagues. COMMENTS: Perfect size mold for my sample size wax melts. The wax released easy. COMMENTS: What a fantastic mold for making thoughtful guest soaps. This photo shows a blue example, but they cone out so much ptprettier if you mix colors like a pink flower on a green or white soap. Or different colored flowers in a boxed set. I used an herbal scent for a peaceful feeling. The soaps come out beautifully. • Silicone mold would be nice. COMMENTS: Makes very cute guest soaps. COMMENTS: I thought the mold was a bit deep so I did not fill it to the rim, especially if you use the 2" metal tin (the beautiful lotus design will get crushed). I really loved the Lotus motif. Very happy with the result. Glad I read the other reviews. Easy to unmold after placing in freezer. The mold is a little flimsy so be gentle with unmold process. COMMENTS: This mold is so cute. Had to figure out how to get the soap out of the mold with cracking it. I just had place in the freezer for 30 minutes. It came out. • Nice petite size soap. • Wish it was a silicon mold. • Hard to get out unless place in freezer. 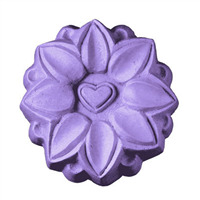 "Lotus Blossom Guest Soap Mold"
COMMENTS: I purchased this mold for a friend. She loves it!!!! She makes guest soaps, beeswax tarts, and lotion bars in it. COMMENTS: I use this mold for wax tarts & I think it's the perfect size. The design is simple & classic. I use a parasoy blend & have no difficulty getting the tarts out as long as they have set long enough. COMMENTS: Deeper than I thought, but very pretty. COMMENTS: I purchased this thinking the mold was the size shown. I got it and thought to myself...its too small. The picture was misleading in the size. I think you need to make a picture of what it actually looks like. Although after I made a few batches with this mold the size didn't matter much anymore. Its perfect for little grab bags and or favors for parties. WSP Response: The mold dimensions are listed for this product. They state: The mold measures 1 1/2" diameter x 7/8" deep and a bar weighs 0.65 oz. This is listed as a guest size mold. COMMENTS: These molds are SUPER cute! Perfect for little samples of MP soaps to send out with customer orders or guest-sized lotion bars or even wedding favors. These are perfect! "Are shrink wrap bags the recommended method for packaging soaps using these small guest molds or are there other options? I like making m&p soaps with them, but the soaps are a pain to wrap because they are so small. Also, you can't smell them through the shrink wrap. " You can go to your local super market and buy saran wrap to package your smaller soaps. This way you don't waste a nice bag and you can still smell the scent. Saran wrap can be use with a heat gun the same way shrink wrap is. "What size shrink wrap would you recommend?" The best shrink wrap size would be the 4x6 bags as they are the smallest ones. If you are selling these individually you can trip off the top a bit and seal it. If you are selling more per bag you could probably fit 3 to 4 in the bags side by side or by stacking them.